While on the hunt to find a cute girl’s purse pattern, I stumbled across this pretty Koi bag from the Sewing Rabbit, this cute little zippered bag, a fast one-hour bag, a sweet tiny bag, and a great zippered pouch that’s meant to be given as a hostess gift…. and now I have bag fever. If one of your traditions is to give the kids new pajamas at Christmas, don’t forget to add a robe this year with this free tutorial from Fleece Fun. 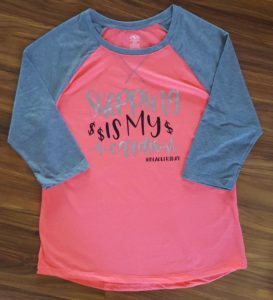 Enter to win 3 yards of Simple Life fabrics! Looking for a quick no-sew project that makes a great stocking stuffer? Two words. Cord Wraps. If you have campers in your life, you need to make them one of these adorable felt mini hoop ornaments. Traveling? Then you NEED to check out this quilted travel duffel and sits atop your rolling bag. I’ve been seeing lots of Scandinavian Gnomes out there lately… this tutorial is even no-sew! In the right fabrics (think stretch velvet), this midi dress would make the perfect party attire. This J Crew inspired scalloped dress is also very eye catching. It’s not even cold here, but I want to make slouchy beanies and fleecy hats so badly! This entry was posted in Uncategorized on November 30, 2017 by stacy. Shhh. I’ve become that person. I’ve become the person that dresses up their dog. Actually, this whole idea came about when talking about Christmas. Every year on Christmas Eve, we open a new set of pajamas. Since this is Jimmy’s first year with us, we decided he needed some too. So, I purchased a Dog Pajama Onesie pattern from Etsy and here is my muslin. Let me start off by saying that this pattern is designed for small dogs… because Jimmy is considered an XXL in this (normally he would be considered “small” in ready-to wear dog stuff as he measures in about 21 lbs.). 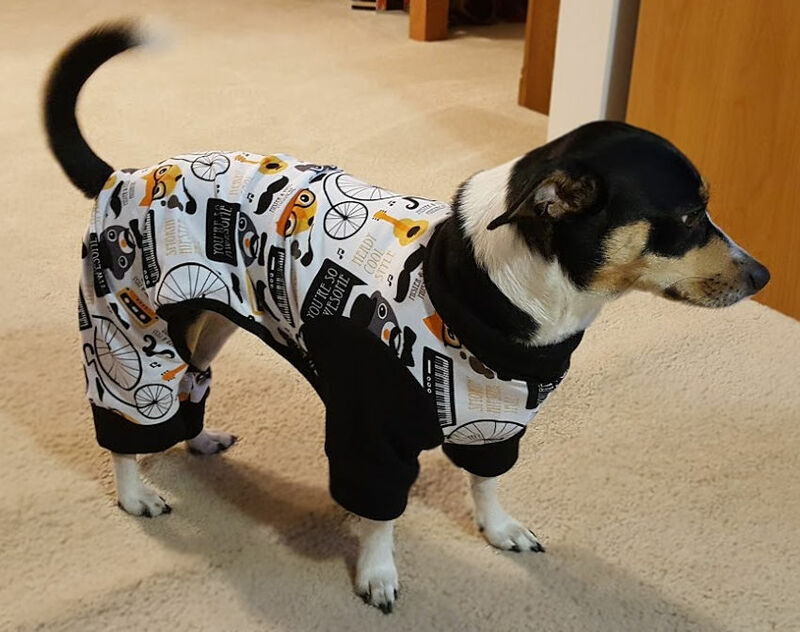 So if you’re thinking about working with this pattern, be sure to look at the sizing first because your pet may be wildly different than what you would expect. Secondly, expect that you’ll have to make some alterations as well. This is the first time I’ve ever done dog clothing mods so I wasn’t sure what to expect, but according to the chart, I needed to take off a bit of the girth (about 1″) and extend the length (about 3″). While I think the girth looks good, the length is too much – his tail is holding up the rear end (otherwise it would have gone way past his behind) and he can almost walk out of the hind legs (plus the middle section is a bit floppy). This time around I may just try extending the length about 1″ instead and make sure that I use a 4-way stretch so that if it is a bit short, it can stretch out over his body some and still be comfortable. I also plan on shortening the neckband some – it’s too wide (IMHO) and looks too much like a turtleneck. This entry was posted in Uncategorized on November 29, 2017 by stacy. The closest pattern that I could come up with that had a similar vibe to the inspiration was Pattern’s for Pirate’s Women’s Henley (sans raglan) – normally, these patterns don’t fit me well, but I figured the material had enough stretch and would size up if I was on the cusp of two sizes. Overall, things came together beautifully. However, the gray hacci (I believe it is this material, but it was part of a bundle) was a bit difficult to work with. While it has a beautiful hand and great stretch, you really need a differential feed for this material to “behave” while sewing. The stripe, however, was perfect. As for the fit, I was very pleased with how this Pattern’s for Priates worked out. 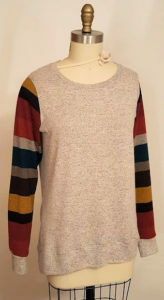 I believe it is mostly due to the style, but I would be willing to give this Henley another go with a different material. This entry was posted in Uncategorized on November 27, 2017 by stacy. This entry was posted in Uncategorized on November 24, 2017 by stacy. With that said, I’m headed to the kitchen to prep for Thanksgiving. I hope everyone has a wonderful holiday! This entry was posted in Uncategorized on November 22, 2017 by stacy. Yesterday I shared a sneak peek of an upcoming Jalie pattern, Galaxie, so how about another? This time it’s a fun little gift wrapping bag, the Pluton! 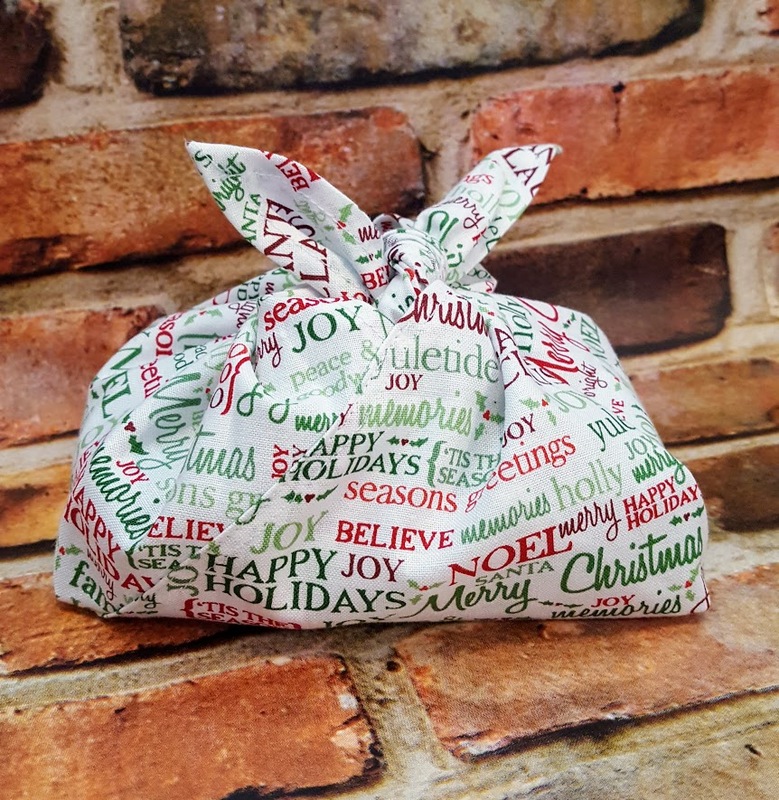 This a cute little wrap bag that can be made in one or two fabrics (for great contrast) that is ideal for holding those odd shaped packages under the tree. Also included with this style are two other versions, the Neptune (which it the perfect size for loaf pans, making it a great way to deliver neighbors homemade breads), and the Mercure (wine\champagne size). Getting excited for this release? Then be sure to take advantage of Jalie’s Black Friday coupon for the Galaxie 1! Use the Coupon Code: 50OFF2017 to save 50% on this pattern (valid from November 24th, 00:01 Eastern Time to Nov. 27 23:59 Eastern Time). This pattern will be available in pdf ONLY. This entry was posted in Uncategorized on November 21, 2017 by stacy. 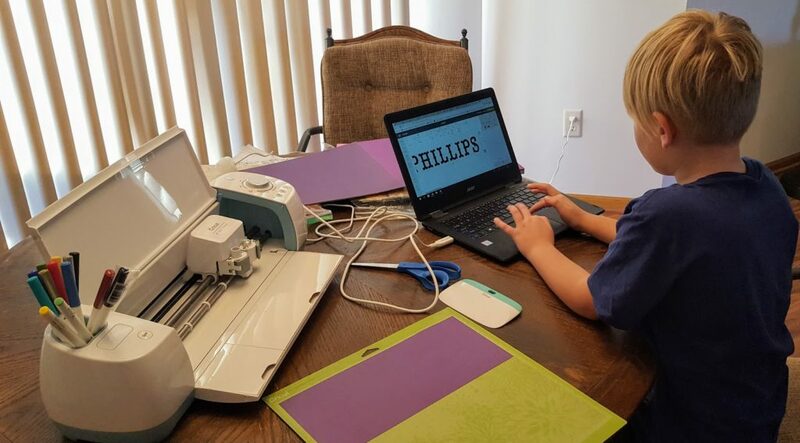 If you’re a long time reader of this blog, then you already know that Jalie is one of my all-time favorite pattern companies. So I’m very excited to let you know that they will have a new pattern out just in time for Black Friday\Cyber Monday – Galaxie! 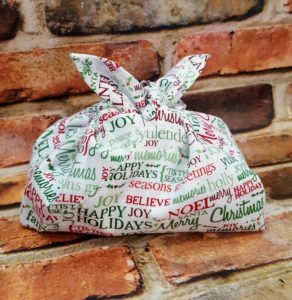 This collection of bags, wraps, and pouches are perfect for holiday gift giving (or wrapping) and sew up in no time. I had the opportunity to test them out and will show some of them to you this week! I love a great box bag, so it only stands to reason that the first project I show you is Mars. 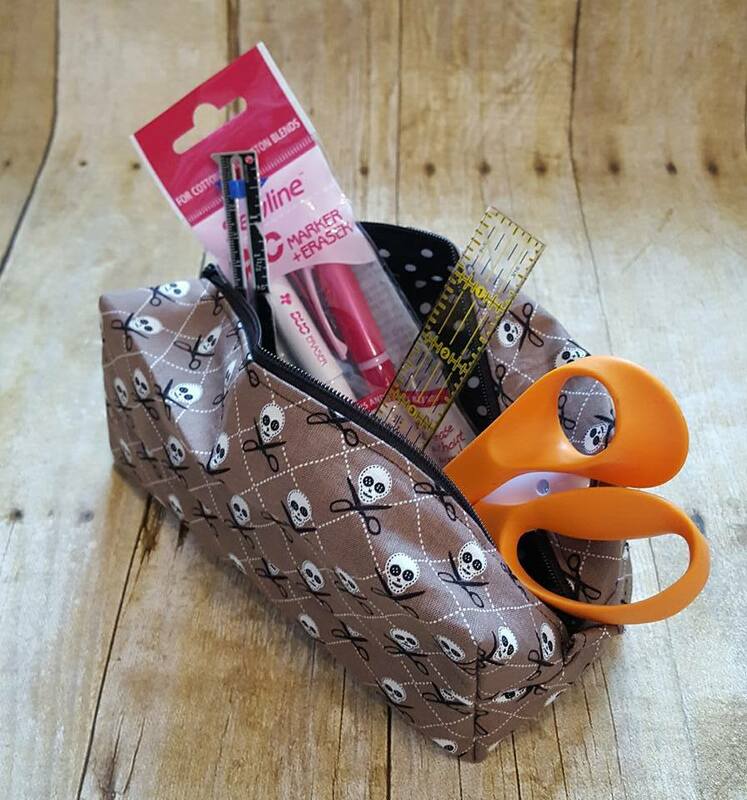 This is a multi-piece, lined, zippered pouch that is perfect for stashing sewing goodies, toiletries, and more. What’s so important about it being multi-piece? You can use a directional\one-way print and half of your bag won’t be upside down (I used a directional fabric in the above photo). The Mars sewed up quickly and the zipper is very easy to install – even if you’ve never put one in before. Plus, it’s he perfect size for stashing sewing notions…. which means that this bag is MINE! This entry was posted in Uncategorized on November 20, 2017 by stacy. 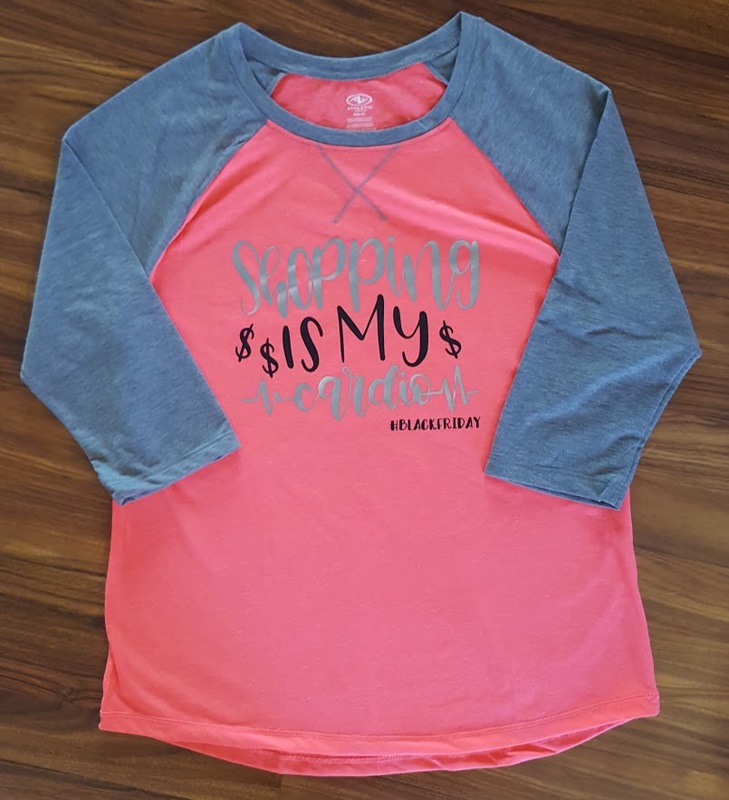 Do you ever get stuck on sewing something up and find yourself making a lot of that item? I do…. and it’s pajamas right now. 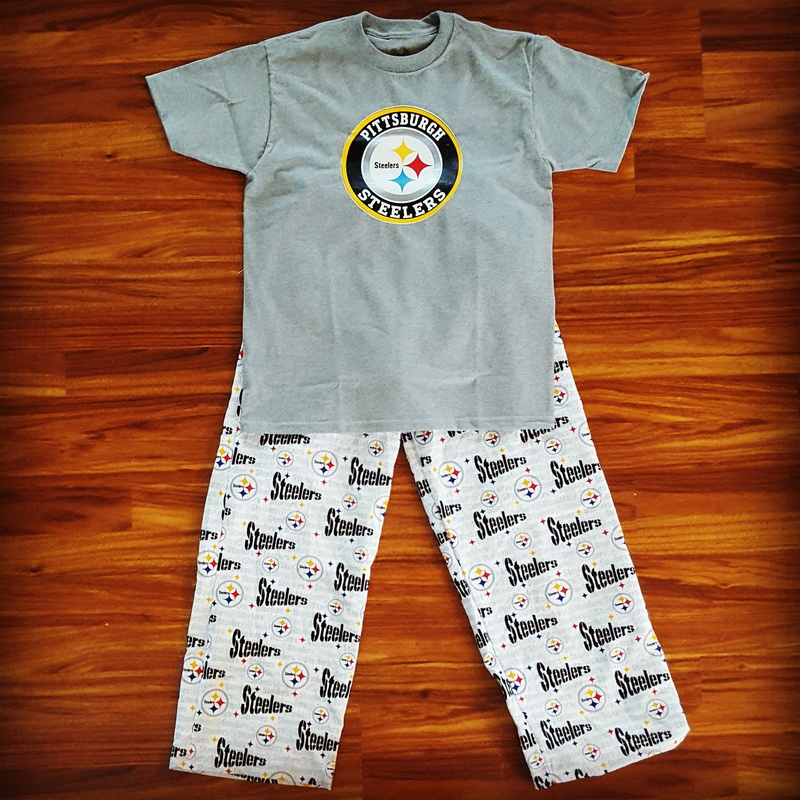 I found myself making another pair for Easton, this time a Pittsburgh Steelers set. For the pants, I (once again) used Peek-a-boo Pattern’s Pajama Party Pants. This seems to be my current “go to” pajama pant pattern as it sews up super quick and Easton loves the way they feel. 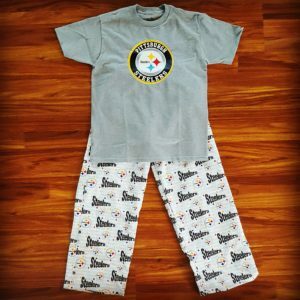 The shirt is purchased and I added a Steelers SVG that I found on Etsy and cut it with my Cricut. Admittedly, the logo has some issues (that you can’t see from this distance), but I will say, it doesn’t look as professional as what you would buy in a store (and the blue is all wrong, too). I’m hoping that if I work with this file again, it looks a little better than what this turned out. Overall, I’m super pleased with this pair and I vow not to make pajamas for awhile! This entry was posted in Uncategorized on November 17, 2017 by stacy. You will definitely turn heads this holiday when you show up in this gorgeous Bergenia Jumpsuit. I love the fact it’s not a dress, too! There are a lot of advent calendar project floating around the internet, but this one, by far, is my favorite. Looking for Thanksgiving table decor? This Give Thanks table runner will definitely impress. Sew your little one a new robe for Christmas morning. Then stitch up a matching one for their favorite stuffed animal. I stumbled across this metal framed purse tutorial today which reminded me of how much fun it was to make. You can check out my version here. It’s getting cold outside which means it’s winter accessory season. If you’re child hates hats, be sure to check out this ear warmer tutorial. Don’t forget the mittens while you’re at it! When Turbie Twists first came out, I gave them as stocking stuffers. Now I can just make my own. These are some of the cutest Santa Hats that I’ve seen. Get ready for Christmas by sewing up new stockings for over the mantel. Change up the look of your favorite chair or bedroom with one of these decorative bolsters. This entry was posted in Uncategorized on November 16, 2017 by stacy. Keep your eyes peeled for the tea towel sew up – while it’s not very exciting, I do love putting them together and they make such fun gifts! This entry was posted in Uncategorized on November 14, 2017 by stacy.